Several factions of Ukraine's parliament, including former Prime Minister Yulia Tymoshenko's Fatherland Party, are planning to launch impeachment proceedings against Ukrainian President Petro Poroshenko, Izvestia reports, citing Fatherland Party sources. A source from the Fatherland Party confirmed to the newspaper that Tymoshenko herself had initiated the legal proceedings to impeach Poroshenko. Her fellow MPs support the initiative, the source said, because "tolerating the corruption and abuses of power is no longer possible." The source also indicated that impeachment proceedings are supported by the Opposition Bloc and Self Reliance Parties, which have the third and fourth largest number of seats in the Ukrainian parliament, respectively. A number of individual deputies from other factions also support impeachment. The Radical Party may also support initiating impeachment proceedings, the source said, but only pending a final understanding of the balance of forces. Ukraine's parliament, the Rada, has 450 seats, with 27 of them currently vacant. The government is a coalition between the pro-presidential Petro Poroshenko Bloc Solidarity, and former Prime Minister Arseniy Yatsenyuk's People's Front, which between them have 224 seats. Tymoshenko's Fatherland Party has 20 seats. The Opposition Bloc has 43, Self Reliance has 26, and the Radical Party has 20, giving them a possible total of 109 votes. Article 111 of the Ukrainian Constitution allows for impeachment to be initiated by a majority of the constitutional composition of the Rada. This means that for the proceedings to move ahead, they would need the support of other opposition parties, such as Revival or People's Will, plus at least some of the Rada's non-affiliated MPs. Pending preliminary inquiries, which would include assigning a special prosecutor and investigators, the charges would be put up to a vote, requiring the approval of two thirds of the parliament, after which the Constitutional Court and the Supreme Court would have to confirm that there is grounds for removal from office. Finally, after that, three quarters of the Rada would have to approve the verdict. Ukrainian legal analysts say that notwithstanding the constitutional provisions, the lack of an actual legal mechanism on impeachment makes it unlikely for impeachment proceedings to go ahead. Political scientist and Ukraine expert Oleg Onopko told Radio Sputnik that today, "there is no legal procedure for Poroshenko's impeachment. In 25 years of statehood, Ukrainian lawmakers never bothered to adopt a law, or at least a framework for this procedure…"
Accordingly, Onopko said that "this action [by Fatherland] should be seen as a PR move by lawmakers competing against the Poroshenko Bloc and political leaders, first and foremost Tymoshenko herself, who are competing personally with the president." However likely the legislators' chance of success is, Fatherland lawmaker Igor Lutsenko told Izvestia that there are at least six good reasons to impeach Poroshenko. These include his alleged failure to carry out his responsibilities as president, including with respect to the question of introducing martial law amid the ongoing conflict in eastern Ukraine. Fatherland MP Sergei Vlasenko told the newspaper that the president had already "earned five impeachments," echoing Tymoshenko's sentiments. 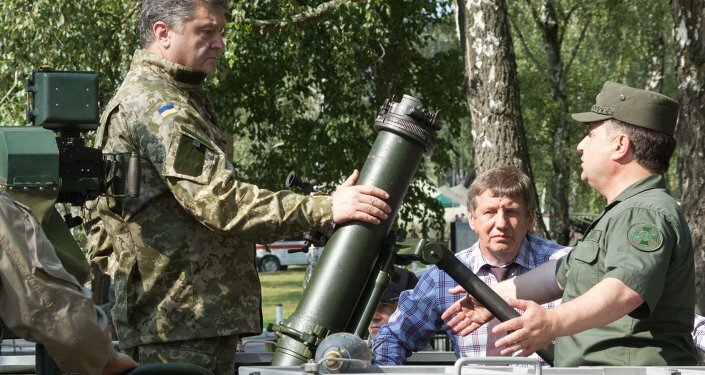 The former prime minister had earlier said that "Poroshenko had earned impeachment a long time ago, from the moment when he began to make a profit on blood, on war, together with his corrupt entourage." According to Izvestia, the draft bill has been introduced to the Rada and will be up for consideration in the near future. Earlier this month, the Kiev Regional Council issued a formal appeal to Rada lawmakers to initiate impeachment proceedings against Poroshenko. MPs declared that the president's activities included crimes against national sovereignty, the Ukrainian people, their civil rights and national security. A recent poll by sociological polling group Rating Group Ukraine revealed that Poroshenko's approval ratings are presently hovering at under 12%. The poll asked Ukrainians who they would vote for if elections were held today. 11.6% answered Poroshenko, and 15.2% Tymoshenko. Oleg Oponko emphasized that the president's low approval ratings make sense. 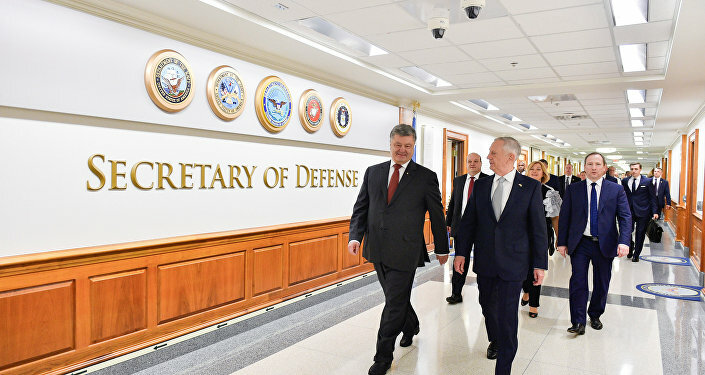 "The idea that there is something wrong with President Poroshenko is something that crept into the minds of adequate-minded people in Ukraine as early as the spring of 2014. These actions (proposing to launch impeachment proceedings) will not affect public opinion, and on the contrary, will only strengthen Ukrainians' appraisals of the existing political regime." "The real question lies elsewhere," the political scientist said. "The issue of early parliamentary elections is being actively discussed in Ukraine right now. It's possible that one of the central themes of this hypothetical future election will be the ineffectiveness of the president and, by association, of the Poroshenko Bloc faction in the Rada. The Opposition Bloc and Fatherland may try to use it to make up for seats lost in the previous elections."